The motivic idea presented in the Five Mystical Songs, the Pastoral Symphony, and Flos Campi also makes a brief appearance in Vaughan Williams’s opera Sir John in Love, based on Shakespeare’s Merry Wives of Windsor. Sir John was composed between 1924 and 1928, and is contemporaneous with Flos Campi. The premiere, conducted by Sir Malcolm Sargent, took place in London at the Royal College of Music on 21 March 1929. In act 1, Anne bemoans the fact that her father wants to marry her off to Slender. She really loves Fenton, who joins her and says that Page, Anne’s father, objects to him because he is too great of birth. Page arrives, orders Anne into the house, tells Fenton to leave, then goes inside. As Fenton remains lingering, looking longingly at Page’s house, Anne (preceded by a solo violin) sings a lament from offstage. The passage is highly reminiscent of the opening and closing sections of the fourth movement of the Pastoral Symphony, not only in general contour and modal content, but also in the indication senza misura (also found in similar sections in Flos Campi). 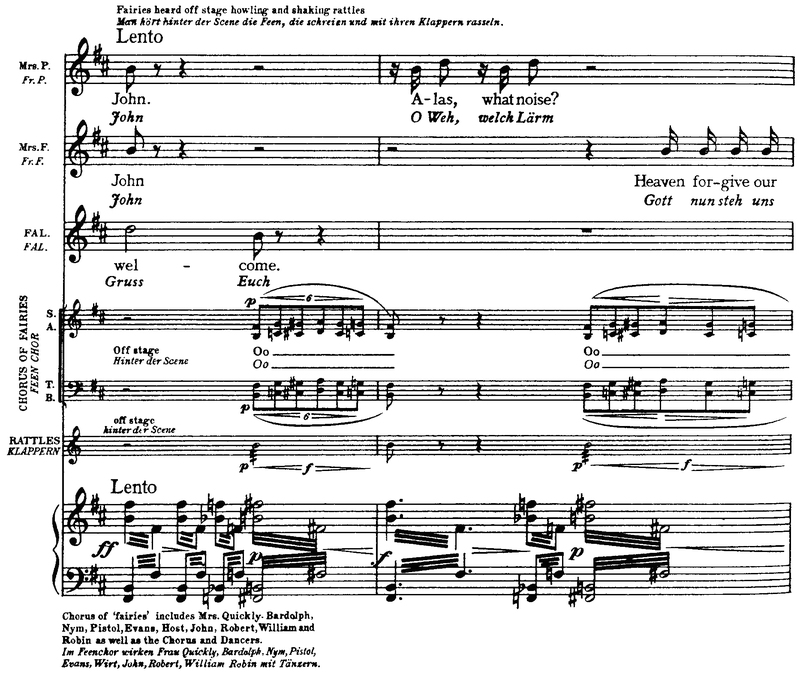 A second example of dramatic vocalization in Sir John occurs in act 4, scene 2, when an offstage chorus represents “fairies” in Windsor Forest. Verdi wrote operas. He did not add music to plays full of superficial philosophy or bogus psychology. He carried on his drama by means of lyric song. His orchestra, it is true, has a wonderful sonority, but it is the voice on which he counts to elucidate the situation. He realized that song can carry on a plot in a way which words alone can never do. In the same article Vaughan Williams points out that the aria “La Donn’ é mobile” acts as a connecting thread throughout act 3 of Rigoletto. It would have been impossible for him not to notice the offstage chorus after this close an analysis of the opera. 1 Ralph Vaughan Williams, Sir John in Love (London and New York: Oxford University Press, 1930), 38. 3 Ralph Vaughan Williams, “Verdi—A Symposium,” Opera 2 (1951): 111.